"The great tragedy of Spain was that in the nineteenth century the working masses apostatized from the Church, as Pope Plus X once remarked. And, it is well to remember, it was poverty, destitution and injustice which made them apostatize. They got to hate the Church because they hated the friends of the Church, who exploited them and whom the Church did nothing to rebuke or correct. The words of Pope Leo XIII 45 years ago went unheeded and his great encyclical Rerum Novarum was neglected. The lesson of all this for us is that we should meet the evil of Communism not merely by denouncing it, and not at all by stigmatizing as communistic all fundamental reforms. We must attack the main causes of Communism. Among these are poverty, insecurity and inequitable distribution of wealth and income. Failure to remove these evils will do more to strengthen Communism than all the propaganda and all the "boring-in" methods of the organized Communist movement." As you read this, the House Republican Study Committee is working on a piece of legislation that will thrill the dominionists. Move over feds and make room for the churches to govern! GOP congressional leaders may bring to a vote within weeks a proposal that could literally wipe out any federal program that protects public health or the environment--or for that matter civil rights, poverty programs, auto safety, education, affordable housing, Head Start, workplace safety or any other activity targeted by anti-regulatory forces. Here's the full article. How did we end up in such a house-cleaning frenzy? No surprise. The Texas GOP Platform has been calling for a serious spring cleaning for years. Such an ax-job lies at the foundation of dominionism. The role of the federal government may not be the sexiest topic, but we'd better pay attention. The federal government is reduced to a few basic functions, and the churches take over the rest. There has never been just one civil rights movement; there have been numerous movements: for Jews and other religious minorities, for blacks, for women, for Japanese-Americans after World War II, and for gays since approximately the 1950s. Nevertheless, it has become a mantra among the religious right that certain groups are "hijacking" the one solitary civil rights movement. Meanwhile, in the small universe of web sites that advertise the existence of "former homosexuals," there are many exgay sites that join the religious right in promoting antigay discrimination -- but few sites that offer sound, clinically proven advice to people who strive to overcome or moderate unwanted sexual attractions and behaviors. 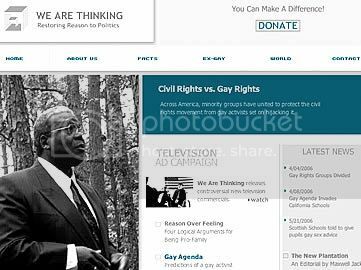 The year-old exgay web site WeAreThinking.com is marketed via Wikipedia as "Ex Gay Political PAC, Focused on Ex Gay Civil Rights." But WeAreThinking has no declared owners, operators, or sponsors, no specific entity to accept responsibilty for its content. In short, the public is not intended to know the identity of "We" in the site name "We Are Thinking." Here's another irony: The site does not propose an exgay civil rights movement; it undermines existing civil-rights movements. Perhaps I'm too busy to look. Maybe I'm in denial, like so many other people. I have four kids and (until recently) two careers, so I have a better excuse than others. But I try to pay attention, and what I've seen disturbs me. Until very recently our little corner of the United Methodist Church has seemed to escape the kind of divisive politics other Christian denominations and organizations within the UMC have encountered. I am largely unfamiliar with the aggressive tactics others have seen in the church over the past few years. I had never heard of a church takeover until I presented my film, "Theologians Under Hitler," to the Georgia chapter of the Cooperative Baptist Fellowship last November. At the breakfast gathering a pastor from Dalton, Georgia was describing the process used by a group that, over a period of several years, effectively gained power in that church and replaced the moderate pastor with a fundamentalist. The Catholic Right, Part Six: Has Anyone Seen Bill? The new video game Left Behind: Eternal Forces contains some of the most vile anti-religious, anti-Catholic bigotry marketed as entertainment for young adults. 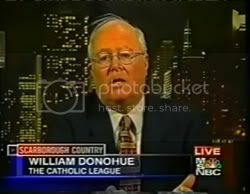 William Donohue and his organization, The Catholic League for Religious and Civil Rights, claim to speak against acts of anti-Catholic bigotry. Yet, neither Donohue nor his League for Religious and Civil Rights has uttered anything even remotely resembling a protest. Apparently his desire to speak out against injustice has its limits. may as well be this week's mantra for the United Church of Christ's fledgling `renewal group' "Faithful and Welcoming." A bit of background: every two years the UCC holds a national gathering (called General Syond) at which we deliberate about policy initiatives, priorities, and resolutions that establish the foundation for the work of the church. A bit more background: the polity of the UCC is such that those deliberations have NO BINDING EFFECT ON ANY LOCAL CHURCH IN THE DENOMINATION. That is important to know. We are a free church tradition bound by covenant alone: the only thing our covenant binds local churches to do is to take seriously decisions made and actions taken by any other covenantal partner. With mainline Protestant churches in the midst of their large regional and national conferences, so-called "renewal" groups are trying to stir up turmoil by attacking the churches' historic support of women's reproductive choice. As in many years past, the Religious Coalition for Reproductive Choice is a target of these "renewal" groups, in particular of The Institute for Religion and Democracy (IRD), an ultra-conservative political lobby in Washington DC. The IRD's campaign against the Religious Coalition for Reproductive Choice is perhaps best characterized as an effort to distort our mission and work and vilify our good name. Repeatedly over the years, the mainline denominations have seen through this deceitful effort and rejected it. Reproductive choice is not the only sensitive issue that is exploited by the IRD and its allies. Gay rights and doctrinal interpretation are also targets of their attacks. They are supposed to be clever - they are not. They are supposed to somehow mimic or mirror the award winning ads which the United Church of Christ have run for the last three years - they do not. What is most striking is the manner in which the second of these equates the aftermath of General Synod last July with the aftermath of Hurricane Katrina. "Amplifying the Mainstream" : Lessons in Reciprosity ? A new story, on the United Churches of Christ website, highlights the snubbing of United Council of Churches leaders by mainstream American media. In Amplifying the Mainstream, J. Bennet Guess ( with editor Rebecca Bowman Woods ) ties the media's pervasive unwilligness to allow leaders of the substantial religious body on television and radio to a decades-long campaign, wth origins in American neoconservatism, to undermine and cripple the mainstream Protestant denomimations. Unfortunately the article also misses recent and upcoming developments in "The Shadow War" including the role of the progressive blogosphere as a vector to publicize IRD-coordinated attacks on the mainline American Protestant denominations. The omissions, likely quite unintentional, underscore the need for greater cooperation among those opposed to the Christian right push for theocratic governent : the whole, as always, is stronger than the sum of its parts. Liberal and even some libertarian-minded conservative Catholics often come to a common realization: a number of the Church's hierarchy often overlook doctrinal disagreements (and in some cases, outright disloyalty) it has with its friends on the political American Catholic Right. More often than not, this policy of inconsistent admonition favors with those who advocate unrestrained self-interest economics--provided they also act to enable secular society to become more conducive to an orthodox practice of the faith. Many of these same princes of the Church will simultaneously wage a scorched earth policy toward what it sees as its opponents: progressives within as well as without the Church. This is not true of the entire Catholic Church, but of a reactionary, "Church within a Church" whose followers often employ ultra-traditionalist lay groups (1) to do this dirty work, many of which were elevated during the reign of Pope John Paul II. Members of this Rightist clique will constantly scream their opposition to choice and stem cell research, while, in sotto voce, give lip service to the death penalty and war -- and say nothing at all, to name one example, about the influence of big tobacco in politics, and the addiction, ill health, death and -- the destruction of families that it leaves in its wake. This is a highly selective use of Church doctrine that cleverly promotes friendly non-mainstream conservative political action often designed to further the personal interests of friendly individuals of superfluously wealth. It is also an outrageous abuse of church teachings to thwart the views of the Church in other areas. Theocratic Media Advancing ? Pay No Mind, Have a Tawdry Scandal ! University of Illinois Doctoral Student John Anderson, producer of Media Minutes and DIYmedia may have covered the "Great Translator Invasion" more thoroughly than anyone, and he's here to bring Talk To Action another tawdry religious broadcasting scandal involving "illicit ungodly relationships", Victoria's Secret, auto parts, and a gun. Oh my. Now, I'm not immune to the charms of salacious, sleazy scandal, but let me say this - after the principals have clawed each other's reputations and bank accounts to bits and are living out of carboard boxes, it's likely some deep pocketed Dominionist media mogul will magically appear to salvage Calvary's LPFM empire - as a good investment and because it's a useful platform for for saturation bombing the hinterlands with certain ideologies. So the scandal will likely amount to another soporific. In the mid 1980's, several televangelists fell from power and the "religious right" was noisily pronounced dead. Several years later, the Christian right had powered the GOP takeover of Congress. But enough of these annoyances called facts - let John be your guide through the Calvary muck. Oh, this really is too much fun. 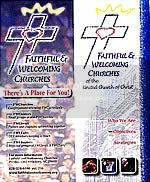 On April 1, the Biblical Witness Fellowship posted an invitation (which was enveloped in another not so clever attempt to smear the United Church of Christ - the church over which they have wet dreams trying to come up with new ways to castigate them). The invitation was to the "thousands" who belong to the "Fellowship of the Ejected." Talk To Action contributor the Rev. Dr. John Dorhauer has kindly provided me with these scanned examples of literature ( see full story for complete set of full size images ) used in attacks on United Churches of Christ churches by fundamentalist "renewal group" para-church groups associated with the far-right funded Institute on Religion and Democracy Listen to a recent, groundbreaking Talk To Action / State of Belief radio show [ link to archived podcast of show ] on these attacks, hosted by Interfaith Alliance head C. Welton Gaddy. See "State of Belief" show description. 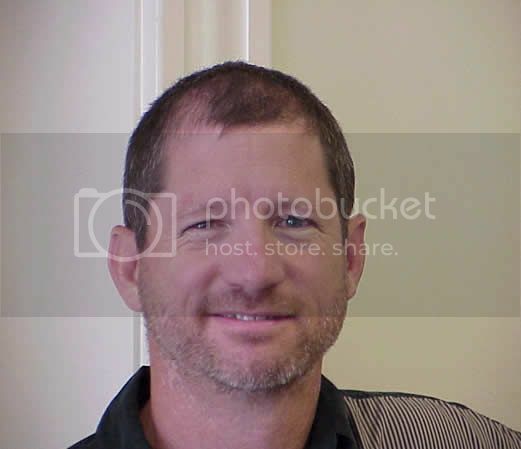 John Dorhauer writes an ongoing series here, on Talk To Action, detailing methods used to attack individual UCC churches and also methods for protecting and innoculating churches against takeover efforts. Such takeover efforts can be highly traumatic to church congregations, and even among those which succesfully resist such attacks - which often feature covert tactics of innuendo and misinformation - those who have lived through such conflicts can be loath to talk openly about the experience. That has worked to cast a veil over the subject which has in turn facillitated this ongoing "shadow war" which is detailed in Dorhauer's writing and also in a dedicated section of collected writings here on Talk To Action which - although very far from comprehensive - nonetheless may have no equal, in its range of material and sustained treatment of "The Shadow War"
All mainline Protestant denominations are under such attack ( see: The Shadow War ), and both the Presbyterian and Episcopalian churches face possible schism this summer.